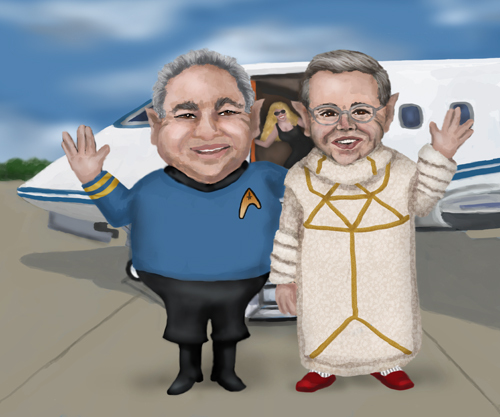 Senator Robert Menéndez and Doctor Delray prepare to board a private jet to fly to the Dominican Republic so the senator can undergo Bunga-Bunga therapy to treat his acute case of Pon Farr. Senator Robert Menendez has been keeping a secret. Although it has been widely suspected among congressional circles for some years, it is only now coming to the awareness of the public as a result of the attention being focused on Senator Menendez by the media over his mysterious trips to the Dominican Republic. The press has been exploring allegations that the Senator has been traveling frequently to that resort island for purposes of enjoying the companionship of young women. These claims came as a total surprise to many people given that the senator had recently attended “Women for Menendez,” a campaign event hosted by a political committee designed to raise money for his reelection last November. The event touted the senator’s record of success as a champion of women’s issues and his commitment to make sure young people are empowered to reach their full potential. In view of his stellar record as a champion for women’s rights, these allegations of philandering could not possibly be true. Or could they? Is it possible that Senator Menendez could have been influenced by factors beyond his control? The answer lies in his closely guarded family secret. It appears that sometime in the very distant past during a time when a Vulcan starship was visiting Earth on a scientific mission, its crew was allowed to disembark on shore leave to explore this unusual planet about which little was known at the time. During that short excursion, the ship’s legal counselor experienced an acute episode of Pon Farr, which as all Star Trek fans know, is an affliction unique to Vulcans whereby they undergo an irresistible urge to mate. Vulcans will die if they fail to identify and mate with a compatible partner within a short window of time. It just so happened that the Vulcan legal counselor strayed into a nearby village and immediately established empathy with an attractive young Earth maiden whom he had quickly befriended (and seduced with the help of a tankard of Romulan ale.) He hastily satisfied his Pon Farr urges and headed back to the rendezvous point to be beamed back aboard his ship. Just as he was dissolving into an effervescent fog, he waved his universal translator and yelled out “I’ll call you!” to the girl. The child that resulted from that union grew up to be a revered member of the community due to his unique pointed ears. He was considered to be a sage among his people and was responsible for many innovations that improved everyone’s quality of life. Untold generations later, Robert Menéndez was born of that lineage that carried the Vulcan DNA. So that was the Senator’s secret. He was part Vulcan. His slightly elongated ears did not particularly betray him, but even back in grade school he irritated his classmates with his logical interpretations of everyday events and he was a hit with the girls when he demonstrated his ability to make a greeting gesture by forming a V with his fingers spread apart between his middle finger and his ring finger while quipping “live long and ace the social studies quiz.“ He was also popular with the nerdy intellectual kids because he could drive the meanest playground bullies into submission by simply applying the Vulcan Nerve Pinch to their necks. So fast forward to 2013, where Bob Menendez is now a US Senator and Chairman of the powerful Senate Foreign Relations Committee. Since late last year, he has suffered repeated assaults in the media regarding extra-official trips to the Dominican Republic on private jets for the purpose of engaging in sexual trysts with young women. Then, as the newspapers and political bloggers began to suggest that the Chairman Menendez was giving a new interpretation to the term “foreign relations,” his staffers rushed to exercise damage control. “It wasn’t his fault,” they asserted in chorus as an increasing number of women began to come forward with lurid accounts of boozy evenings spent in the company of the senator at elegant private villas in Santo Domingo. Indeed, it was not his fault. He could not help himself and cannot really be held accountable for his actions. The senator had inherited a recessive gene from his Vulcan ancestor that left him vulnerable to progressively more severe episodes of Pon Farr whereby he had to immediately seek out intimate female companionship in order to avoid succumbing to the condition’s potentially fatal consequences. As it turned out , his closest aides had been aware of the senator’s affliction for some time and had become concerned about the possibility of an embarrassing incident on the Senate floor should Senator Menendez lose all control and attempt to satisfy his uncontrollable urges with, heaven forbid, a female colleague like California Senator Diane Feinstein. Menendez’s staffers had quietly enlisted the aid of a respected Florida physician who has extensive experience treating this physical and psychological disorder and who has worked with other high profile politicians in developing a remedy for those afflicted. Several years ago, the physician, who prefers to go by the moniker “Dr. Delray.” worked with Italian Prime Minister Silvio Berlusconi to develop a highly effective course of therapy which was rolled into a ritual that they called “Bunga-Bunga,” that emulates an ancient Vulcan tradition. Because Pon Farr’s effects are difficult to predict and could erupt at any moment without warning, Doctor Delray engaged a renown Romulan therapist with a Eastern European ties to watch over the Senator during his flight and take care of him should he experience a sudden surge of Pon Farr energy while airborne. The news media is correct in stating that the senator cannot really be held accountable for actions because he is undergoing Pon Farr, a medical and psychological phenomenon that is unique to Vulcans. Furthermore, the senator himself is cautioning any potential political critics that he will consider any negative comments about his activities to be evidence of discrimination against him based on his Vulcan heritage.